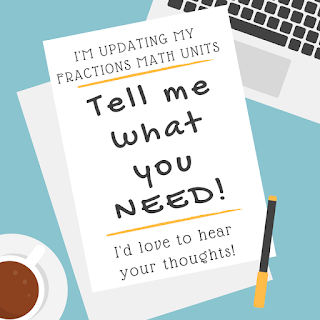 I'm currently in the process of updating my 3rd, 4th, & 5th grade fraction math units for you. 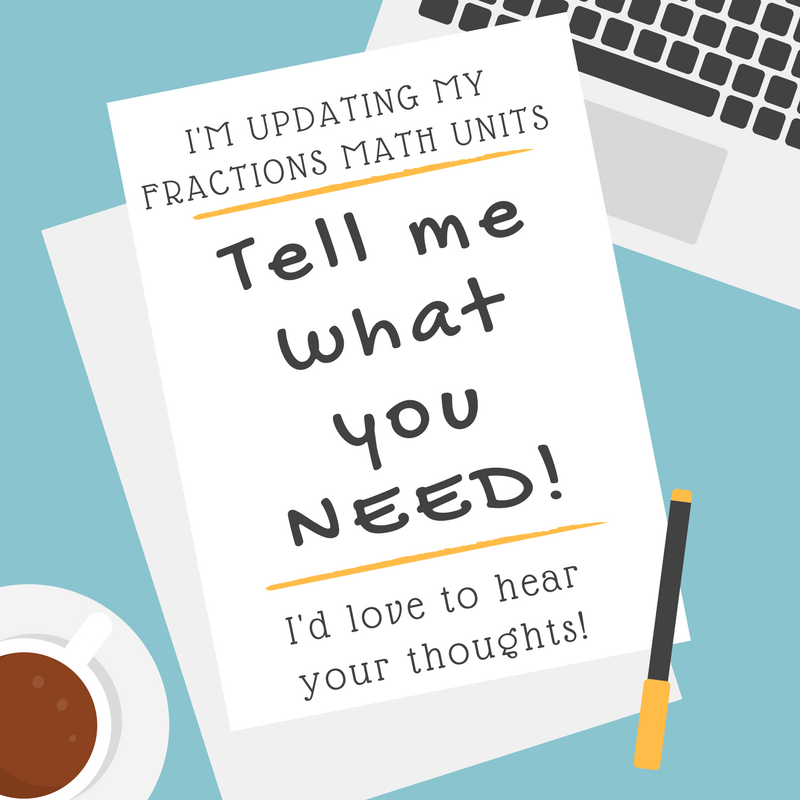 I'd love to hear your opinions & thoughts (whether you have used them or not!). Please feel free to tell me what you need & want in the 2 minute survey below. -immediately after the winners have been named, move the students into new teams. -there’s an editable map (in PowerPoint) of our classroom that I use to create new teams by moving the students’ names around. I keep it secret until it’s time for the students to switch into new teams. Then, I project it onto the board and let the students move their desks to match the map. -Moving the students so frequently helps the kids get to know each other and creates a stronger bond and class culture. -If parents (or students!) are upset about their seat placement, I can just remind them that it’s only for (at most) ten school days, and then they will be moved to a different spot with a different partner and different team. -Almost all of the responsibility for running the system is on the students. They move their desks, they set up the team points chart, and they can even collect their own prizes (if you set up a system for it). The teacher just needs to award points and make the new seating chart by moving the names around on the slide. -This system grows with your students, as they mature. In the beginning of the year, I spend a lot of time awarding points for things like: getting ready on time, listening, raising your hand, having your pencil, etc…. basic direction following and things we need to do to have order in the classroom. As the students mature, I start to award points for things like: making sure your partner understands a concept, reminding your team to bring home their math book for the homework assignment, being honest even when it’s hard, making good choices, working hard to improve in something, or helping someone from another team clean their desk and get organized. At first, students will do these things to earn points, but eventually, it just becomes part of your class culture and part of who the students are as human beings. PS: You can get my printable Team Points chart parts here, if you don't want to make your own. Foundational reading skills are the basics of phonic, decoding, and fluency. It’s the actual reading the words part of reading (as opposed to the comprehension part). In primary grades, students are largely ‘learning to read,’ meaning they learn to decode the letters and accurate read them. In upper elementary, students focus more on ‘reading to learn,’ where they switch over to working more on comprehension. But, like most of education, we these skills overlap heavily, and teachers will need to support students in both areas. Even though the focus in upper elementary is more on comprehension, we can’t neglect these foundational reading skills. If students are truly struggling with basic phonics and decoding in upper elementary, most likely they are going to need an intervention in this area. But, for our students that are (more or less) on grade-level in this area, there are many ways to support foundational reading skills in the upper elementary classroom. 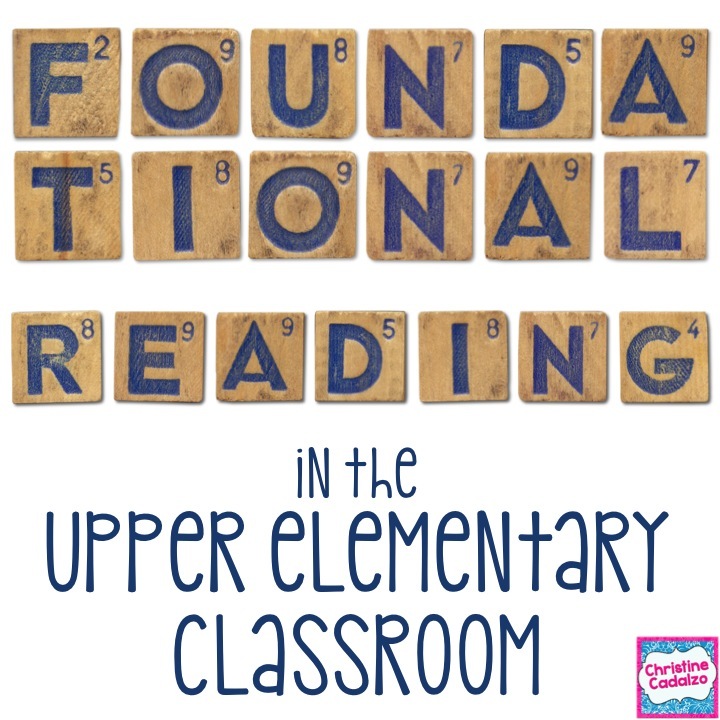 What are the foundational reading skills students need in upper elementary? 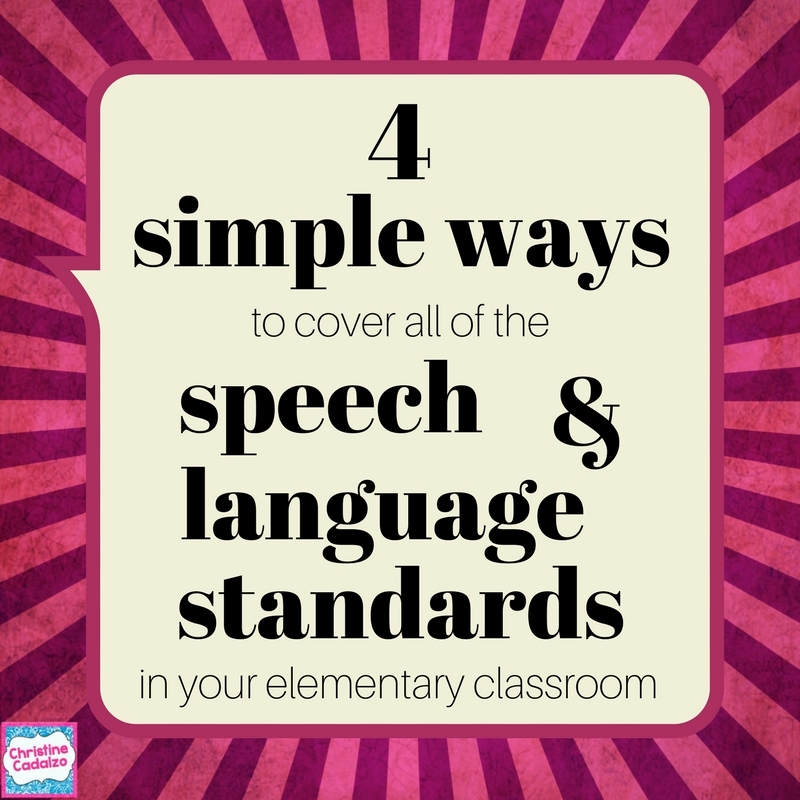 They fall into three areas: decoding, fluency, and oral fluency. -These are especially good for reviewing irregularly spelled words. Collect them throughout the school year as you come across them. Students can even keep their own mini-dictionaries of irregular words. -Use example words that have prefixes, roots, or suffixes that the students will come across, so they can use these words as a reference. -Use word walls as a reference for phonics and other skills students will need for decoding. -strategies decoding multisyllabic words. Connect the written word and each syllable/ affix/ root with its sound and meaning. -Whenever possible, give the students copies of the read aloud text, so that they can see the words in print as they hear them. 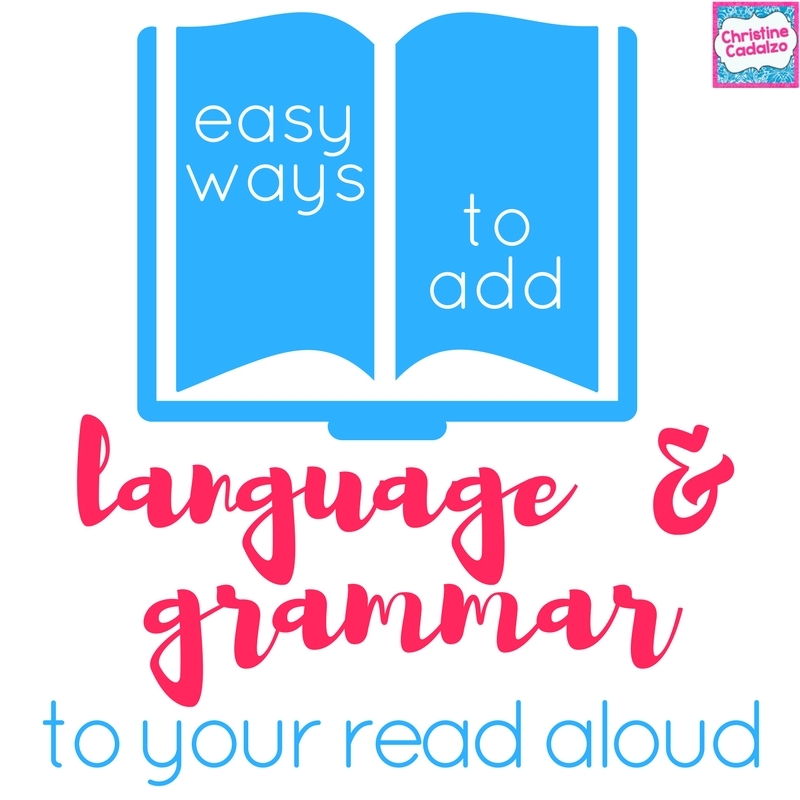 Connecting the written words with the the auditory will help them become more fluent. -Provide opportunities for multiple readings. Have the students practice a paragraph or page until they can read it accurately and with expression. This works especially well with poetry. -Do partner work. Students can read to each other or to younger students (or even to pets!) to become more accurate and expressive with their reading. It can be really hard to fit everything in to our ELA instruction. Often, it’s language and grammar that gets left out, but these are important skills that our students need in order to become truly literate. One way to fit these sills in is to work them into our read aloud time. -ask: what does this particular pronoun mean/ refer to?